In Nigeria, different dance steps have emerged alongside various music as well as the artist who introduces them, but I will talk less of whoever introduce it and just the dance and its step. Naija is known to introduce new dance steps every quarter. At first we were saying its Brazil, then later South-Africa but with deep research in the past 10years no other country have invented dance steps like Naija – from “Galala” to “Swo”, “Alanta”, “Konto”, “Makosa”, “Alanta”, “Shoki”, “Wobe”, “Kukere”, “Ijo Owo epo” “Gaga Shuffle” and now “Gbera”, who knows what will come next. 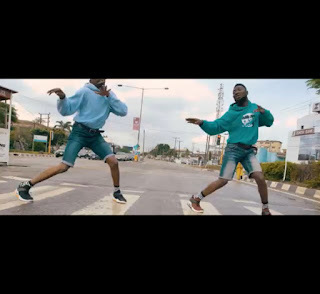 The “Gbera Dance” also known as Shaku Shaku. Though this dance move have been there for some time but became prominent after Olamide dropped his tight single titled “Wo”. The dance step starts from legs to hands – You jump up and down lightly and slowly with legs joined together as if tied with ropes, then you move your body from right to left (right-left, right-left) continuously, while doing the first two moves, your two hands are crossed (as if cuffed) but crossed. Once you’ve gotten these three moves, you can now progress to the main stages. This stage I can only teach you but I don’t advice you do it in front of old people, your parent, church, mosque or even infront of a stranger, the reaction might surprise you! Lol! Now the next stage, while the first three steps are going well, you start pulling either hand back and forth as you move your body from left to right (as if trying to start a Tiger Generator but no need to lean forward). To make this more interesting you can reduce your height by going down a bit (not squat position, can’t do full squat if your legs are joined). And you can take your craze global by doing your face like Terry G dancing Alanta. Go Gaga! This dance step can also be practiced with Dj Real’s Adoyoyo done on CDQ’s “Say Baba” beat. There is another way, you can practice like the ladies in lounges or clubs who sit and dance no matter what, especially while smoking Shisha. Guys you can try if you have no shame or won’t feel shy. Just sit on the …couch… holding whatever and just move your waist upward (body) form right to left following the beat, now smile…. Yes! More! Aiit! The rest is on you. I still remain your Uncle…Fadaka.